Early in 2010, when my secondhand book collecting – an interest which had only really been kindled the year before – was gathering pace and Existential Ennui was drifting towards its eventual destination as – and stop me if you've heard this one before – an increasingly circumlocutory chronicle of what has since become, let's be frank, a flaming obsession, I decided to finally try The Hunter, the first novel in Richard Stark's twenty-four book series starring taciturn heister Parker. I'd been thinking about it for a while before that, having long been an admirer of John Boorman's 1967 film adaptation of The Hunter, Point Blank; indeed it was in the British Coronet movie tie-in paperback edition – a slightly scruffy copy since replaced with a rather nicer one – that I eventually read The Hunter – retitled, accordingly, as Point Blank. 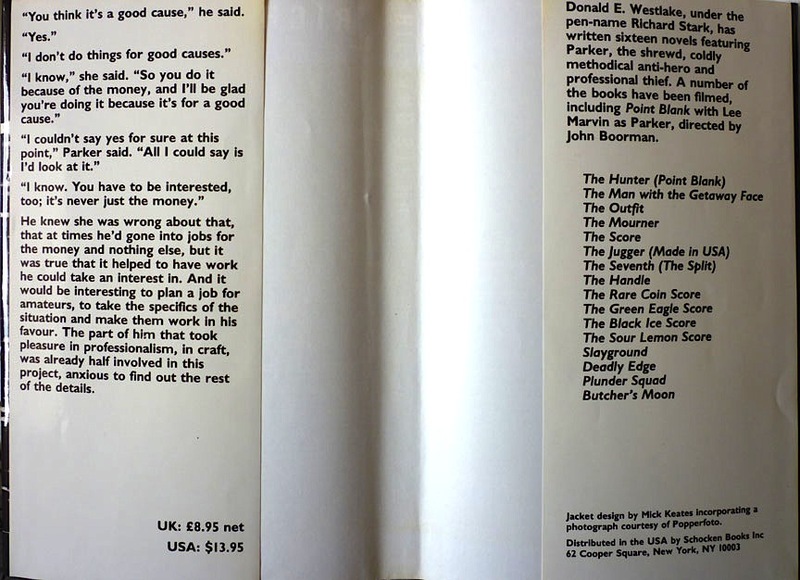 At that stage I wasn't giving much thought to how I was collecting the Parkers; I just knew I wanted to read them, preferably in cheap, vintage paperback editions (which, given that they were mostly out of print in the UK at that point, was how they were largely available). 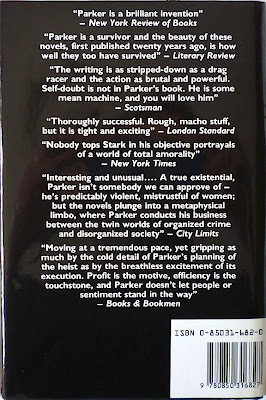 Then I encountered Allison & Busby's hardback editions of the Parkers, issued in the UK in the 1980s. 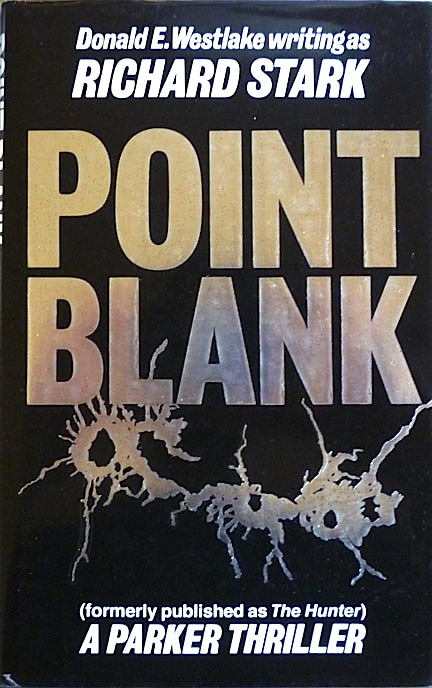 I think I first saw a copy of the 1984 A&B edition of Point Blank, with its black, foil-embossed bullet-holes dust jacket (designed, like the bulk of the A&B Parker jackets, by Mick Keates), on the shelves of the late lamented Nigel Williams Rare Books on London's Cecil Court – priced out of my range, naturally (I rarely ever actually bought anything from Nigel Williams, much as I loved the place). My book collecting inclinations were increasingly leaning towards modern firsts, and consequently my curiosity was piqued: though the A&B Parkers weren't, strictly speaking, the first editions of the novels – for the sixteen Parkers in the original 1962-1974 run of the series that honour belonged to American publishers Pocket Books and Gold Medal in the '60s and Random House in the '70s – they were the first hardback editions (in most cases; Slayground was published straight to hardback by Random House, and I later discovered that another three of the Parkers A&B published were first issued as hardbacks by Gold Lion in 1973). Here, then, was an interesting way for me to collect the bulk of the Parker series, one which I readily – perhaps foolhardily, given how pricey some of them were – embraced. 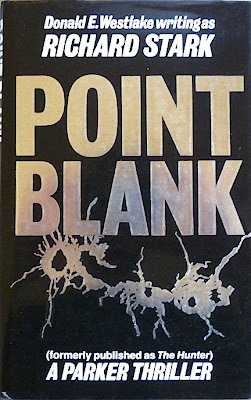 I secured a relatively inexpensive copy of Allison & Busby's edition of Point Blank, and over the next six months managed to track down the majority of the remainder of the thirteen Parkers A&B issued in hardback (A&B did publish a fourteenth title, Deadly Edge, but only in paperback), chronicling the quest on Existential Ennui as I did so. 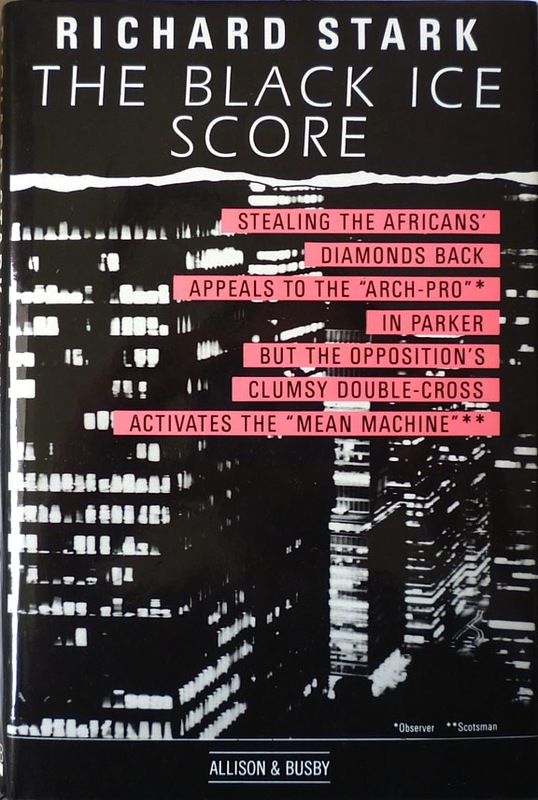 That there is the first (and only) hardback edition of Richard Stark's The Black Ice Score, Parker #11, published by Allison & Busby in 1986 under a Mick Keates-designed dust jacket and won by me on eBay last month. The irony here is that the Parker that took me the longest time to acquire in hardback (I bought an Allison & Busby paperback in 2010 as a stopgap) is the one that I probably like the least – but that's by the by; what matters is what it represents: the last piece of a collection that has taken me over three years to complete. Which leaves me with an odd mixture of feelings. There's a sense of accomplishment, sure, but also a little sadness (in every meaning of the word, heading any quips off at the pass). 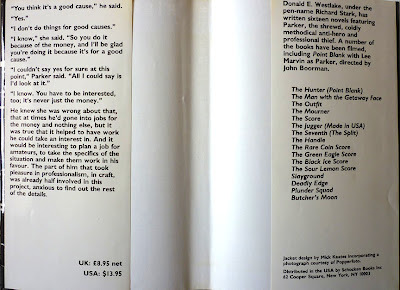 Trying to find all of the Allison & Busby hardback Parkers has been a constant in my book collecting, not to mention my blogging about that book collecting – the one feeding the other. My crazed quest to collect all of the A&B editions helped to build Existential Ennui's (admittedly still slender) readership: I know there are some folk who began following the blog as a direct result of that quest. (Some of them have even stuck around, poor buggers.) I guess reaching the end of a journey – to use X Factor parlance – any journey, however minor and inconsequential it may be in the grander scheme of things, can be a bittersweet experience: arriving at a destination only to realise it was the getting there that was the thing. 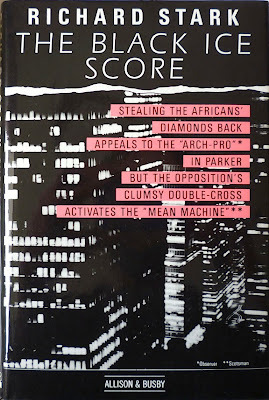 I always envy you when I'm reading your Parker's Score blogposts. 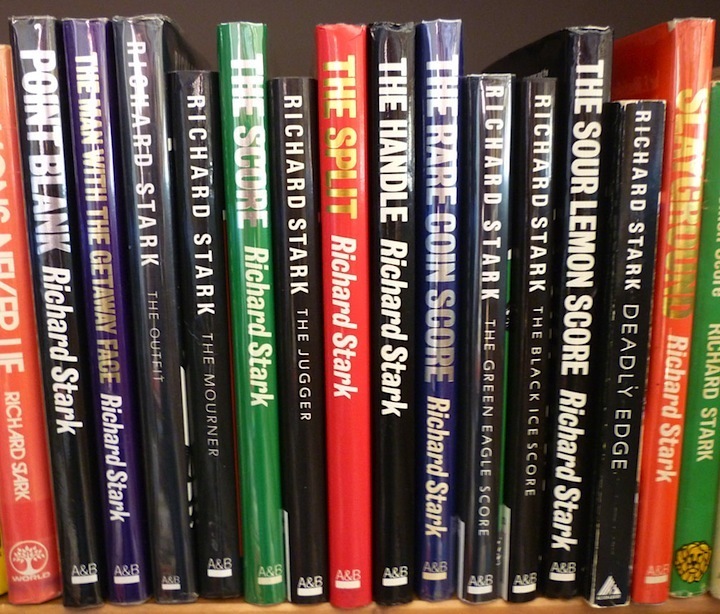 Your blog inspired me to collect Parker books, I've been hunting Stark books for half a year, I think. But my collection is small, only two hardcovers and half a dozen PBOs from Gold Medal and Pocket. 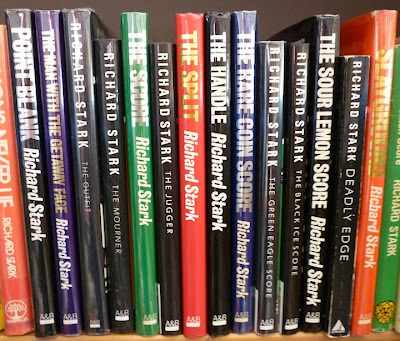 I confess that I, too, have had the occasional thought of filling out the gaps in my Westlake/Stark collection by paying an unannounced nighttime visit to Casa Ennui. But I am over that now; I want to visit Westlake's attic instead. The Westlake I despair of ever finding is "Comfort Station", written as J. Morgan Cunningham. Now given that the title of this one actually refers to a public lavatory, you would think it would not be in such high demand, but that's the problem, no doubt--probably weren't many copies to start with, and now the few that are still out there are being held hostage on the internet for princely sums. All it takes is one collector desperate enough to bite, so knowing what they have, they jack the price way up. Could always happen across a copy at a flea market or something. Sure. That'll happen. I figured 'Hey, no prob, just find a copy in a library somewhere--just to read it.' I work for a college library, and can borrow books through our interlibrary loan dept. No dice--WorldCat never even heard of it. Even the Research Branch of the New York Public Library doesn't have a copy. You could find an genuine original copy of the freakin' Necronomicon easier than "Comfort Station." Anyway, congrats on your score, Nick. I bet we all think we could come up with a plan to do this but if reading Westlake has taught us anything it is that we are more likely to wind up in a Dortmunder caper than with a Stark heist.